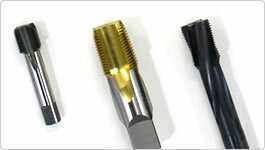 We make, for example, spiral taps that eject chips from rear of the tool, whereas spiral point taps which have flutes to push chips forward towards the tool’s moving direction. We also have pipe taps and pipe taper taps that are used for parallel threads and taper threads of pipes, components related to pipes, and fluid equipment. The taps for parallel threads are used for mechanical joints. The taps for taper threads are used for pressure type joints such as water pipes and gas pipes.